These Mobile Acoustic Vocal Booths are easy to setup and put away, you can easily transport them in a car or ship by a postal carrier. The sound absorbing cover made out of Producer's choice acoustic material that absorb 80% of ambient noise (NRC 0.8). Although not designed to be sound proof, the booth seems to block approximately 10-13 dB of the outside noise. This is why we call them "ACOUSTIC", AVB series, they are designed to create an acoustically dead environment. We also have Mobile Soundproof(er) Sound Booths. SPB series. That give about 30 dB noise reduction. Acoustic Vocal booths AVB33, AVB63 and AVB66 is a stand alone product and come with a complete frame. We also have HAVB - Hanging Acoustic Vocal booth, that is designed to be suspended from a single point in the ceiling. In addition to our walk-in booths, we offer the Vocal Booth on Tracks. This is a "vocal booth on demand" solution that allows to create a vocal booth by "a draw of a curtain". It includes a Ceiling track kit and a blanket or two (purchased separately). The use of ceiling tracks or wall track can be very versatile. You can easily cut your room in half and have a make shift studio, or you can isolate a portion of your apartment as dedicated studio space without having to build a bulky framework. What does the mobile acoustic vocal booth do for you? Allows you to get clear sounding recording. Acoustic Vocal Booth absorbs sound is it goes through the cover, cutting echo and reverberations. It also reduces outside noise by about 10 dB. Allows you to be flexible in your work space. If you have limited space, these booths can be easily removed and put away. Gives you true mobility. If you have to record on location, these booths are very quick and easy to set-up and take down. You can take these booths to your client's site, trade shows, on trips -- just about anywhere. Better Value for your money! 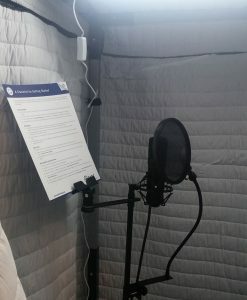 The SoundProof(er) Sound Booths (SPB series) provides completely enclosed space, with heavy soundblocking walls, yet easy to take apart, pack in bags and move in a regular car or by a postal carrier. Booths come in three different sizes that can work from one person to a small music band. The booth's walls are made of our proprietary material, specifically designed to reduce sound transmission by about 30-40 dB (STC 33). The sound booth includes acoustic blankets for cutting down on reverberations and creating optimal acoustic environment for audio recording in the booth. Because of its considerable soundblocking efficiency, comparable with rigid sound isolation enclosures and ability to fold them up and put away in a bag, these of these mobile sound booths are an ideal solution for use in urban environment for music and singing practice. They make it possible to play instruments or sing anytime without disturbing your neighbors. (Keep in mind that no room is 100% soundproof.) What does the Mobile Sound Booth do for you? Practice musical instruments without disturbing your neighbors. Make clear audio recordings. Use as mobile Conference room for noisy Trade show exhibits . . This booth, in a folded state, can be transported in a car or even sent by mail. You can take these booths to your client's office, at conferences, on tours -- just about anywhere. The Sound Booth 3x3 can even be set up in a tour bus! Easy to assemble and disassemble. There are no tools required! Just snap-on into place. No confusing parts. Excellent value. SPB soundbooth series offer soundproofing efficiency similar to enhanced versions of the rigid wall vocal booths, yet they cost much less and much more mobile. Please be aware that the soundblocking layers are very heavy, so you may need help to set up the booth. Even with SPB33, we recommend two people perform the assembly.